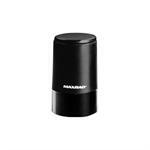 PCTEL 698-960 MHz/ 1710-2500 MHz dual band 3 dBi gain Low Profile Vertical antenna. Black with black base. Order Motorola style mount separately. The Option CloudGate LTE Gateway Modem connects to just about anything with on-board processing power and connectivity. All carriers are approved on this CloudGate M2M cellular modem, which is also easy-to-install and powerful.